Yesterday was my day for the Gossamer Blue blog this month. Oh, yes! I'm happy to be able to say here's one I made earlier. If you'd like to head over there, you'll find more details about my layouts and how I put them together without even opening the November Main Kit. about a shopping trip with my sister. The clothes were great: but the 1970's themed changing rooms were even better. Look at the roller skates! And the kitchen! With Fray Bentos tins! No, I didn't buy that dress, but I did enjoy taking pictures. And this page is about an anniversary. We've been together for a while now. The odd decade. Or two. Or three. I'm hoping we have a few more left in us. Many thanks for understanding about Monday. I'm hoping normal service will be resumed next week. Congratulations on 30 years - WOW. I really like your journaling on the anniversary page. I am sure there are at least another 30 left in you both. What fun that dressing room would have been. Our fitness class instructor loves to theme up our workouts with the 80's music - she is desperate to bring back leg warmers! The anniversary page is fabulous ... just look at that tall skinny house! Well done on 30 years. That is quite something. I love the changing rooms. 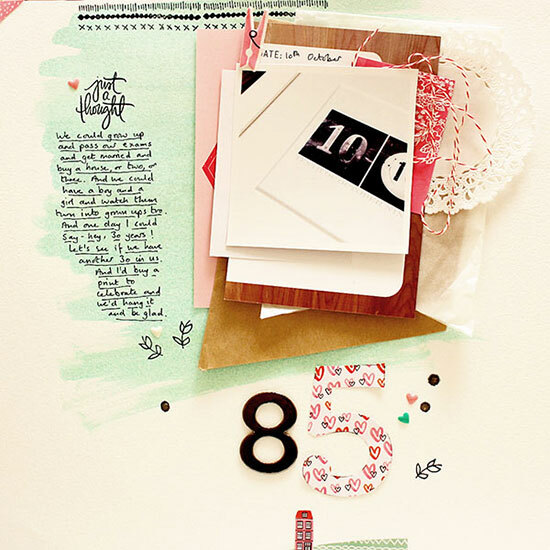 Love your anniversary journaling.....and,of course, Happy Anniversary. Happy Anniversary! That's wonderful count! Love both layouts; I must admit I love to shop, and being in the right dressing rooms, with the right people, is a great deal of fun---purchases or not! Both wonderful pages Sian - I love how you painted the background green (I'm assuming you did this and it wasn't a printed page). I have never been to the 'White Stuff' and obviously I am missing something. Those changing rooms sound just incredible and worth a visit for those alone. Wonder where my nearest branch is?! So lovely. The journaling on the anniversary page is so touching. I always love the idea that, in a relationship, you're a little team. [Possibly the only team sport I enjoy being part of!] And that everything that happens needs to be run by just 2 people - and if that's what the pair of you want - then that's that, decision made! Here's to spending lots more years on the same team! Thirty years? That's really something. Congratulations! How wonderful to have met just the right person to be on your team (to pinch Julie's analogy) at such a young age. I'm always a little envious of those relationships with so much shared history. It's a very special thing to have. That's a real achievement these days - well done! 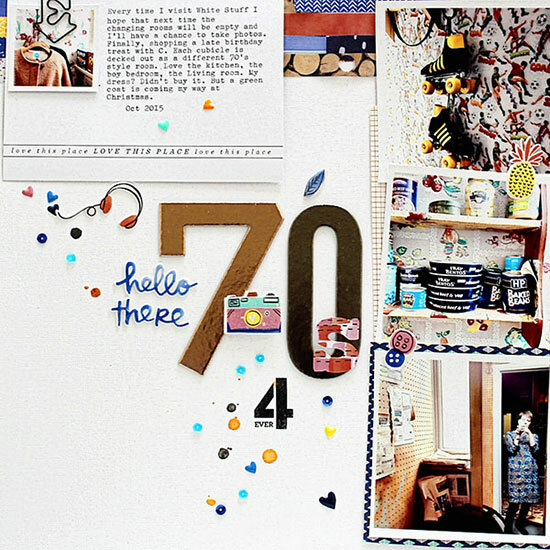 LOOOVE those changing rooms & the 'confetti' on your page... The green wash on the bg of the together page is Yum too:) hope you're feeling more yourself now!!! You'll have to do a tutorial on your painted backgrounds, they are fantastic. (As are both layouts). My 70's roller skates went on OVER your shoes, they had the little lace up 'straps'. You had to be rich to afford roller boots! I'm a big White Stuff fan as well, although our changing rooms aren't as themed as yours. We do have heavy draped velvet curtains and fancy clothes hooks but no Fray Bentos or roller skates in sight! Being a child of the 70s I'd have loved to have seen that. Great pages! What FUN dressing rooms & congrats on the anniversary! Lovely layouts and those changing rooms look amazing! Congratulations. I like the layers and scattering around the 85. Wookie & I had our anniversary this week too, didn't celebrate and only one card was given - thankfully we've been together long enough we're o.k. with that. They both look lovely and congratulations on your anniversary! Hope you had a nice celebration for it.